It’s a new year and with that comes all kinds of resolutions and challenges. From exercising and healthier eating habits to saving money and so on, we all have some sort of goal in mind for a fresh start in 2019. I think something we are all challenged with on a daily or weekly basis is keeping up with the housework. Maintaining a beautiful home does not have to be stressful. 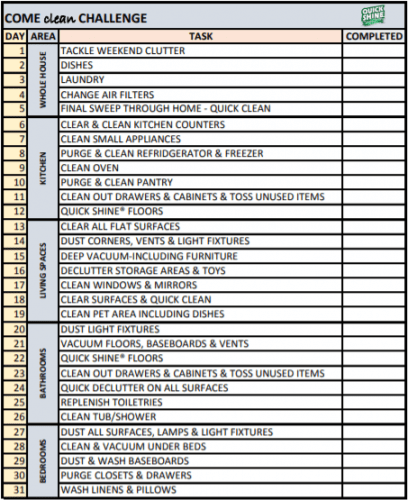 If you carve out a few minutes each day, you can have a clean and organized house every day. We want to challenge you this year to COME CLEAN. By sticking to our 31 day challenge, you will see the transformation taking place in your home. Quick Shine® Floor Finish is the perfect touch to complete a clean home. It’s Like a New Floor in a Bottle! Simply squirt and spread for an instant glow. Consider it a spa day for your floors.